Home builders are selling an emotional experience as much as a residence to buyers. A big part of that experience is the overall comfort of a home and insulation plays a major role in achieving comfort. 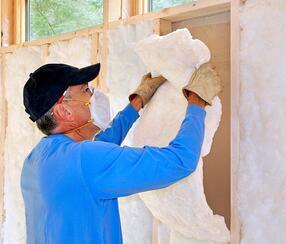 But, poor quality installation can negatively impact the performance of the insulation. That’s why hiring the right insulation contractor is a must. Savvy builders know that product cost isn’t the only factor in the value equation, and while some contractors will check all the boxes and agree to meet all of the requirements for the job, there’s a level of detail involved in doing the best quality work. If the focus is on superior quality installation, builders should ask three questions of the insulation contractors who want to work for them. What training do your crews receive? While batt insulation installation isn’t rocket science, it’s much more intricate than simply putting the product into the wall cavity. Builders, particularly those who construct high performance homes, need the assurance of knowing that contractors are training their crews on proper installation of batt insulation, including the installation of an air barrier as well as how to install batts in walls with obstructions, recessed light fixtures and tubs, among other areas. With crew turnover high, training crews regularly on proper installation practices is essential. Florida based Providence Homes worked with Building Science Consultant Steve Easley to develop a continuous training program for installers that focuses on quality air sealing and insulation as well as inspection and quality assurance procedures to ensure consistent delivery of Energy Star® certified homes for the builder. Easley called continuous training the most important element of ensuring top quality installation. Are your installers salaried or piece rate? If your insulation contractor’s installers are paid at a piece rate versus salaried, the installer’s need to make a living will take precedence over the builder’s need for quality. This sentiment has been repeated numerous times by other leaders both in construction and marketing, including Marketing and Advertising Specialist Kelly McDonald of McDonald Marketing. McDonald told insulation contractors at last fall’s ICAA Convention that the industry best practice is to compensate installers “slightly above” market average or to make installers salaried employees. The bottom line is that contractors should make clear to their installers that quality is the expectation, versus speed and compensate and motivate installers to achieve the best quality, versus the quick completion of a job, as we covered previously in our blog on the topic. What is entailed in your quality control process? Another familiar refrain in our conversations with insulation contractors and building industry professionals is that training without inspection or quality control is insufficient to achieve consistent quality installation. Insulation contractors must make inspection and quality assurance routine in their operations and builders should be asking if inspection and quality assurance are emphasized with installers. This is important for all builders, but especially for those seeking HERS ratings or other high performance home certifications, as poorly installed insulation can negatively impact scores and/or eligibility, as we’ve detailed in this guide, covering the business case for builders on the value of getting Grade I installation and how to develop repeatable processes to ensure consistent delivery. Understanding how your insulation contractor trains, compensates, motivates and assures quality will enable you as a builder to get insights into how your insulation contractor values quality. Standard bid responses will entail general scope of work descriptions but may not address the quality measures that increase your ability to get top notch installations with each job. Addressing these questions with your contractor should help you select those most focused on delivering consistent, repeatable quality insulation installation.